Most of you who know me understand that I’d be hard pressed to leave the Gulf Coast. However, if I had to, my love for all things green would lead me straight to N.C., which is where I’ve been all week. Reveling in the most spectacular nurseries, arboretums, and gardens in the southeast, I am in plant heaven bliss! This week I’ve been attending the national Garden Writers Association symposium in Raleigh, N.C. Beginning with a trade show to knock the trowel out of any gardener’s hand, I have benefited from the generosity of sponsors and exhibitors alike. As I write this my hotel room is bulging with plants, books, and garden tools to take home, so don’t ask me how I’m going to get everything in my car. You may see me roaring down I85/I65 with luggage strapped to the top of the car, as the plant loot rides safely inside for the eleven hour journey. In between visits to the show, the sponsors have wined and dined us, and the association has presented wonderful topics to enhance our business as garden writers. But the real take away has been the tours they have arranged. 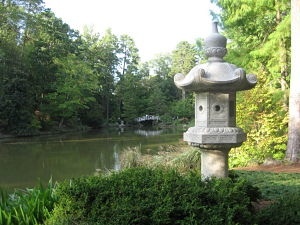 Beginning with the Sarah P. Duke Gardens at Duke University, my heart has been leaping with gardening joy. 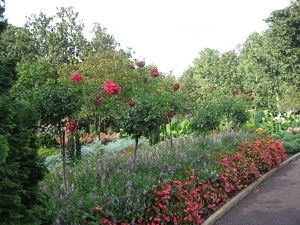 One of my favorite landscape architects, Ellen Biddle Shipman, designed a portion of the 55 acres called the Terrace gardens, in memory of Sarah P. Duke. But, just imagine having 55 acres to develop into whatever gardening desires you may have! 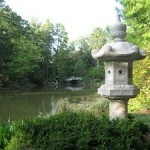 From formal to wilderness, from native to Asian gardens- you name it, the Duke Gardens has it. Next on our schedule was an early morning tour at the Plants Delight Nursery for a photography session. Not only is it a nursery, but within the six acres, there is the Juniper Level Botanic Gardens, a wonderful collection of mostly southeast U.S. natives “showcased in an aesthetic home-style setting”. For me, the “home-style setting” was magical, as the Avents (owners) created a sunken garden, a waterfall with a deck overlooking it, and a rock garden, just to name a few features. I encourage you to visit because there is so much more to know and understand about this treasure. Just down the road is a private garden, owned by John Dilley and Willie Pilkington. Wow! They showed us a picture of what the property used to look like- basically an open field- so we could understand the undertaking and passion behind their garden. What you see today is a hidden paradise within an acre, plus some. Planting unusual specimens, the two gardeners created a dreamy landscape in an urban area. Last night we visited the JC Raulston Arboretum, where we strolled the gardens and ate N.C. BBQ. I could go on and on about these tours, however, I have to close to make the bus for the next outing-Montrose Gardens, S.E.E.D.S. 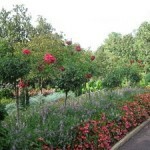 (South Eastern Efforts Developing Sustainable Spaces, Inc.), Witherspoon Rose Culture, and North Carolina Botanical Garden. With all this talk, I leave you with one thing. GO! Visit this gardening mecca of the southeast- it will warm your heart and set you on fire for digging in your own backyard dirt! I can’t wait to get home and start dreaming for my clients as well as myself!